Last time we checked in on French animator wasaru, he’d been busily animating a rapid fire slew of characters for Kaly Live Dub’s guilty road trip promo Allaxis. 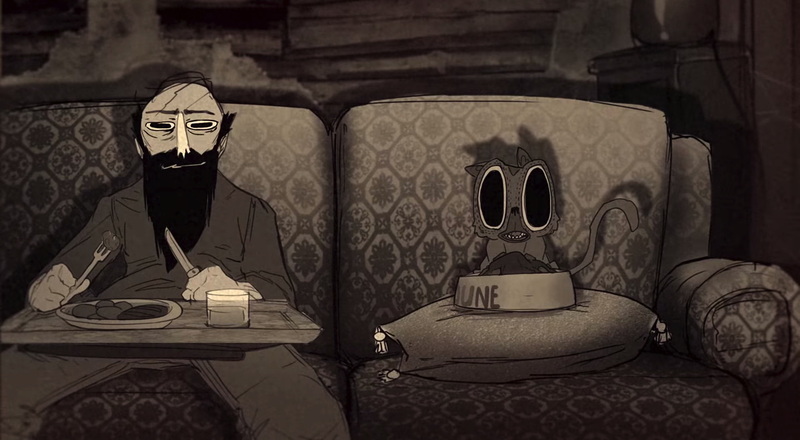 Now taking things in the opposite direction, wasaru slashes his animated the cast list down to a lonely man and his cat to tell a dark tale of interdependence for Sage Francis’ Make Em Purr music video. We asked wasaru to share how he combined multiple treatments and brought the project home on a tight timeframe. This was a quick step, because when I contacted Sage Francis the album had just been released. I knew that I wouldn’t spend two weeks on the treatment. When Sage sent me the song, he said something along the lines of, “I’d like something sad/dark, a guy living in a trashy place with a bunch of cats”. So, I started thinking (with my colleague Jebedaï) and we quickly came up with a treatment. Sage loved it, but actually it was a really dark and sad treatment. 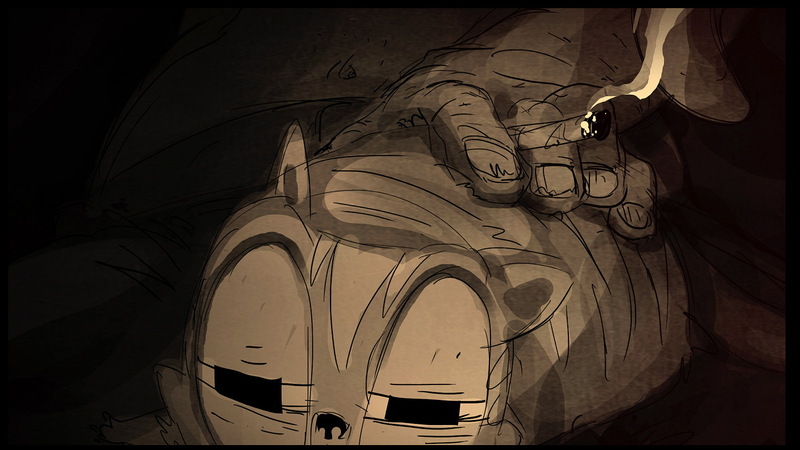 Meanwhile, Jim Foltice (who made Love the Lie, the previous animated music video for Sage Francis) sent him his own treatment, and it was way more positive at the end of the story. With Jim being unavailable to direct the video, Sage asked us to adjust our treatment to be more positive too. And we did it, picking up part of Jim’s treatment (with his acknowledgement of course) and mixing it with our own. That turned out to be relatively easy because our two treatments were pretty close and we definitely loved how the ending played out too. I usually work alone, in my small apartment. If I’m helped by any colleagues it’s often online, so we never need to meet. But, as Jebedaï had just quit his full time job, we decided to work in his house to be more effective in the communication process. More reactive. More human too 😉 We were in a rush and we didn’t want to take any risks in the techniques. So we used what we use everyday at work: Jebedaï designed on Photoshop and Cintiq and I animated in Flash with a Wacom tablet, compositing in After Effects. …Classics. As far as I can remember, Sage gave us the green light and then we spent two months working before delivering the whole video. But not both of us full time, since I had other work to complete and Jebedaï was still working full time. I firstly made an animatic to let Sage have a look at the overall product. He loved it, at which point we really started to work on it full time at Jebedaï’s house. That was great. During the production, I was listening to Sage Francis’ discography. I knew it before, but not deeply. I’m now totally fond of all of his albums… I cant wait to see him live in November, in Brussels in the same venue I saw him for the first time back in 2010. Usually, when you complete one design, you should change 20 things to make it better (not every time)… those are the retakes. Retakes are boring for an artist, because it slows your creativity. Creating retakes takes a lot of time…And most of all, sometimes they’re absolutely not necessary. So, for the first time I decided to refrain from retakes! In the end, I’m not fully satisfied because of many details… but, I’m very happy with what we did in that short amount of time. Thanks a lot to Jebedaï Couture, this guy is able to draw as fast (and a lot better) as a machine. When I sent the final video to Sage, I didn’t expect that he would still love it…but he did, and we were totally relieved. I hope this video will help to broadcast Sage’s music because it deserves it. I’m so proud to be involved in that. Despite that, I wish we could have made something bigger and better… However, this is the main thing that I am proud of in my career so far.